Members of the South Fraser Track and Field Club combined for 21 medals at the BC Junior Development Championship meet in Nanaimo. 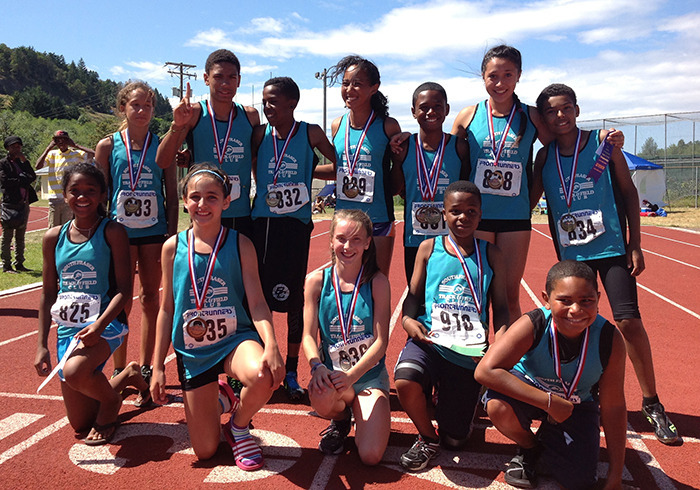 Surrey North Delta Leader – A group of 13 athletes from Surrey’s South Fraser Track Club (SFTC) returned from the B.C. Junior Development Championship meet in Nanaimo earlier this month with 21 medals and 20 top-10 finishes. Jasmine Lew won her 200m reach and placed second in the 100m, achieving BC Athletics standard (eligible for selection to provincial team) in both events. Her times in both races were the fastest in the province in the 13 year-old girls category. Amanda Moore set a new personal best and achieved a BC Athletics standard while winning her 300m race. Her time was also the fastest of the season in the 13 year-old girls group. She was also third in the 200m and sixth in the 100m races. Two other 13-year-old girls had success. Alyssa Terry was second in the 800m race and set a personal best while placing fourth in the 300m event. Jade Krieser placed fourhth in the 300m with a personal best times, and was seventh in both the 100m and 800m. The four young athletes teamed up to place first in the distance medley. Two 10-year-olds completed the group of female athletes from the South Fraser club. Lana Sabet was third in the 60m and second in the 100m, while Janelle Chhun placed sixth in the 100m, seventh in the 600m and 12th in the 100m. Nico Depaoli posted three top-three finishes, including a first place finish in the long jump. On the track, he as second in the 100m, 200m and 800m sprints, and was third in the 300m while making the BC Athletics standard. Jaheim Minott, Jamal Mensah and Jesaiah Penson-McCoy, a trio of 12 year-olds, dominated the sprints. Minott placed first in the 100m, 200m and 300m, and added a third-place effort in the long jump. Mensah remained undefeated this season in the 80m hurdles event, and had two personal best races in the 100m and 300m sprints, placing third in both races. Penson-McCoy was fourth in the long jump, sixth in the 100m and eighth in the 800m. Depaoli, Minott, Mensah and Penson-McCoy won a pair of team events, placing first in the 4×100 relay and the distance medley. Fraser McKay, 11, was fifth in discus, seventh in high jump and long jump, and eighth in the 600m and 1,000m races. Bronson Depaoli, 11, was 12th in both the the 60m dash and shotput, while Javon Minott, 10, placed fourth in the 100m, fifth in the 60m and 10th in the shotput. Parksville Qualicum Beach News – The Oceanside Track and Field Club’s Junior Development program wrapped up recently with the B.C. Athletics Junior Development Championships. The championship event was held close to home this year, with athletes from around the province converging on Nanaimo for the three-day event. Ten local athletes placed in the top eight in their events, competing against the best B.C. athletes. IN OTHER NEWS: Twelve OTFC athletes competed in Kamloops July 19-21 at the BC Athletics Championship event for athletes 14 and older, with many vying for spots on BC teams to compete later in the summer. The Nanaimo Track and Field Club is developing some standout athletes, and it showed this past weekend at the B.C. Junior Development Championships. The provincial championship-level meet was held Friday through Sunday at Rotary Bowl stadium. Nine-year-old boys – Jake Putz, third, high jump, third, shot put; Jayden Watson, first, 800m race walk, second, 600m, second, 1,000m, second, 100m dash, second, high jump, third, 60m hurdles, third, 60m dash; Stirling Henry, third, 100m dash. Nine-year-old girls – Carys Menard, first, high jump. 10-year-old boys – Brett Schlitz, second, high jump; Jake Seaman, third, 1,000m; Ryan Seaman, second, 800m race walk, third, javelin. 10-year-old girls – Madison Paugh, third, 800m race walk, third, javelin; Olivia Lundman, first, 800m race walk. 11-year-old boys – Ethan Andersen, third, javelin; Ethan Katzberg, first, long jump, first, high hump, second, shot put, second, discus, second, javelin, third, 60m hurdles; Keaton Heisterman, first, 600m, second, 60m hurdles, second, 1,000m, second, high jump, second, 200m, third, long jump, third, discus. 11-year-old girls – Makayla Mitchell, first, 800m race walk. 12-year-old boys – Colby Day, second, javelin; Nate Seaman, first, 800m, first, 1,200m, second, 800m race walk. 12-year-old girls – Courtney Anderton, second, 300m, third, 200m, third, 100m; Julia Dimter, first, 800m race walk; Kaitlyn Watson, first, long jump. 13-year-old boys – Dominic Boar, first, 200m hurdles, first, pole vault, second, 90m hurdles. 13-year-old girls – Hope Stewart, first, pole vault, third, 1,500m race walk, third, hammer throw; Jessica Katzberg, first, pole vault, first, discus, first, hammer; Madison Heisterman, first, 800m, first, 1,200m; Marina Andersen, first, 1,500m race walk.